Authoritarianism is on the rise in different corners of the world. Following in each other’s footsteps, the strongmen of our times pursue a war on democratic institutions with no respect for the rule of law. Their rise to power entails many similarities. These leaders turn their personal cliques into civil juntas to take over their parties to eventually capture the state. They regularly plot scandals to urge democratic institutions such as the judiciary to take action, victimize themselves in the face of these actions, and then attack those institutions as the culprits for their own faux victimization. They silence the opposition in a cacophony of bigotry and conspiracy theories. Coupled with fabricated data and distorted collective memory, their contradictory and often nonsensical rhetoric aims to paralyze the public intellectually. What makes this phenomenon perplexing is the fact that these governments come into power in countries that are anything but similar. For instance, the United States has a long-lasting political system backed by its strong institutions and semi-holy texts such as its Constitution. Hungary reframed its entire political regime after it gave up on socialism in the early 1990s. Turkey was the outpost of the struggle against socialism during the Cold War. Different religious, regional, ethnic and racial tensions characterize the daily politics of these places. Sources and magnitudes of income vary as well. However, despite all their differences, these countries are now ruled by strongmen with similar types of aspirations. In fact, any country may now have its own Trump, Orban, or Erdogan regardless of the subtleties of its political background. The question is then how such similar political styles emerge in such different countries. I believe studies comparing today’s authoritarianism to the pre-Second World War totalitarianism provide only limited and probably misleading answers to this riddle. Yes, oppressive regimes in the 1930s used tactics unquestionably similar to the ones we witness now. Nazis as the epitome of the fascist era used anti-Semitic conspiracy theories to justify first their rule and then the Genocide. They plotted spectacles such as the Reichstag Fire to attack the legislative and judicial bodies along with universities. Hitler first purged Anton Drexler, a leader in the already extremist National Socialist German Workers’ Party, and turned it into his personal apparatus in the service of his junta. In short, like today, strongmen between the Great Depression and the Second World War used bigotry as their discursive strategy and scandals as their means for political mobilization. Nonetheless, today’s authoritarianism also differs from the pre-Second World War totalitarianism in some important respects. Erdogan’s Turkey is, I believe, one of the cases that most vividly illustrates these differences. First, like their counterparts in 1930s Germany, democratic institutions in Turkey today are under a never-ending attack, yet they are not disestablished and replaced with new ones: the Turkish constitution still states that Turkey is a secular country, even though it is a well-documented fact that Erdogan’s government sent weapons to jihadists in Syria. On paper, there is still a judiciary, a parliament, and universities in Turkey, yet these institutions are now staffed with yes-men selling their conscience for money or tenured positions. These institutions are now redesigned to facilitate cronyism under Erdogan’s rule. In other words, Erdogan’s “war” is not a spiritual or ideological struggle for a new institutional order; he simply wants existing institutions to serve for his kleptocratic order. Second, Erdogan has accomplished quite a few plots over the last fifteen years to bring an end to democracy in Turkey, as the Nazis did in the 1930s. Nevertheless, he still does his best to convince both the domestic and international public that there are free elections in Turkey. Thus, his censorship is well-targeted: those, who carefully avoid touching hot potatoes such as the Kurdish question and thereby pose no real threat to his power, such as right-wing secularists, are allowed to freely state their minds, albeit with sporadic harassment by Erdogan’s prosecutors to give the public the impression that he takes them seriously. Others are silenced and severely punished. Sadly, those who are allowed to speak commonly attack those who are silenced. They blame Erdogan’s victims for being puppets of U.S. imperialism, supporters of terrorism, or, at best, having weak and naïve minds, intellectually manipulated by those imperialists and terrorists. They are hostile towards the victims, because Erdogan’s tacit approval privileges them to monopolize the representation of the oppressed in Turkey. Turcae Turcam lupus est: Erdogan picks and chooses the tolerable opposition in order to divide and rule the country. 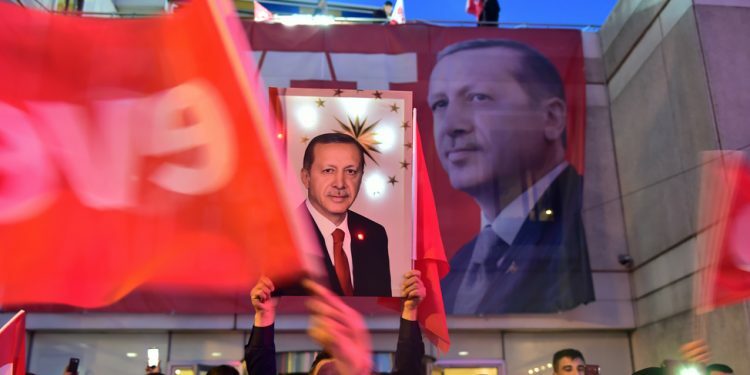 He has also partially convinced dissident citizens in Turkey that he is not an unrivalled autocrat, thereby alleviating some of the pressure by Western democracies. Third, like the Nazis, Erdogan’s junta feeds on scandals: for instance, he used the Turkish military against civilians in Turkey’s Kurdish urban centers in 2015 with security forces allegedly killing up to 171 civilians under the pretext of fighting armed militants. The intention was to mobilize the chauvinistic electorate to the ballot box and later to purge scholars protesting his inhumane political agenda as known as Academics for Peace. However, unlike the Nazis, Erdogan’s junta cannot tolerate high risks. Even in the case of the coup attempt in 2016 in Turkey, which was possibly the biggest risk Erdogan ever took in his life, there is convincing evidence that he was well informed about the initiative well before the plot, yet still let the plotters proceed so that he could capitalize on their imminent failure and accomplish his own coup as a major step in his project of state capture. In the case of an escalation of a conflict by a power not easily tackled, however, he immediately seeks reconciliation, for example, his rift with Trump on Pastor Andrew Brunson’s unlawful arrest. In other words, all Erdogan needs are bloody spectacles, not risky adventures. In short, if Erdogan’s Turkey has any relevance to other countries under threat by autocratic leaders, what we see here is the rise of “petty strongmen,” rather than a network of totalitarian regimes changing the world order. On the one hand, these leaders are strongmen because they are unrivalled in their domestic contexts. On the other hand, they are petty because tribute-seeking frames their political strategies. Their worldviews fall short of forming viable international coalitions challenging global institutions but only succeed in short-term Machiavellian regional pacts that help each petty strongman taking part in those diplomatic vaudevilles to maintain their kleptocratic order. Overall, risk aversion limits their capacities for political action. Nonetheless, they still like portraying themselves as David fighting Goliath, even though the best character to describe them is Don Quixote fighting the imaginary giants. Petty strongmen are not charismatic leaders. They are rather shallow narcissists used by parasitic interest groups to level the economic playing field within politics. As a matter of fact, the clientele consolidating the power of today’s authoritarian leaders reminds me of herpes viruses: they live on their hosts but do not dare harm their vital organs. They exploit their host to the degree that they do not irrevocably break its homeostasis. At this point, cultural, political and economic powerhouses of the world tolerate leaders like Putin and Erdogan because they do not pose an existential threat to the world order and it would be costly to replace them. twentieth century: the declining income gap between the Global North and South. As the two graphs below illustrate, the income gap between these two camps widened at least since the 1960s until the collapse of the Soviet Union in 1991. The gap stopped growing exponentially in the 1990s and the trend was in fact reversed in the 2000s. This is ironic because the new period favoring the Global South coincided with the political dissolution of the Non-Allied Bloc after the Cold War. In this historical context, new resources flowing to the South were now less likely to be used for human development and more likely to trigger a secondary redistributive struggle within those countries: whenever parasitic groups won over the facilitators of this transformation such as workers and businesspeople with cunning and resources, we witnessed the rise of petty strongmen and their authoritarian parasitism. Those, who sell their goods to Europe and North America with low or no tariffs without being bound to the same labor standards in their market countries, spent years in local politics to make Erdogan look like a charismatic leader. Similarly, Orban represents those in Hungary, who want higher subsidies from the European Union without sharing the costs to “fix” the refugee crisis. The same global redistributive process created its own strongmen in the North as well: albeit only in the initial steps of his state-capture project, Trump represents those, who would like to keep both consuming cheap Chinese products and enjoying trade protection for their low-tech goods. Once again, the Turkish case is particularly useful to see why it is so difficult to identify these parasitic groups in an analysis of today’s authoritarian regimes: Turkish export volume grew by a factor of five in Erdogan’s Turkey, but workers’ share from the GDP remains the same and they work longest hours within the OECD. Belying the myth of miraculous growth, the number of poor people has not declined for the last decade. Interestingly enough, the share of the first 1,000 industrial enterprises in Turkish GDP has also been declining since the early 2010s when Erdogan began to take critical steps to capture the state. If we limited our assessment to these interest groups, we should conclude that Erdogan represented nobody but himself, but this kind of an argument would be certainly misleading. Winners of the redistributive struggle over the new riches of globalization are the middle-persons running the sweatshops. These petty entrepreneurs with no substantial resources or cunning in business basically serve as foremen in global industrial supply chains. Back in the 1990s, they facilitated foreign capital’s entry to Turkey, but they are now not only dispensable for the operational purposes of those supply chains but also a major impediment to the growth of Turkish economy. Nonetheless, they have Erdogan, and his politics keeps them alive thanks to various nonsensical subsidy schemes and construction projects by the government such as an artificial water canal between the Black Sea and the Marmara Sea located just eighteen miles west of Bosporus, which ships can already pass through free of charge. Cold sores are, I believe, a good metaphor to describe today’s petty autocrats; a nuisance that is harmless for the host organism. If these strongmen do not pose an existential threat to the global order and all they do is oppress their fellow citizens, then why to worry? I am worried because what we see now may be just the precursor of something similar to the totalitarianism of the 1930s. The late nineteenth century observed the rise of similarly parasitic leaders and cliques. This was the Belle Époque of capitalism when late comers including Germany and the United States dominated the world economy and semi-European powers such as the Ottoman Empire and Russia undertook major reforms of modernization. As new countries claimed or borrowed a growing share of the net wealth produced in world economy, parasites in different forms emerged and shaped the politics of those countries. As an autocrat of his age, Sultan Abdulhamid II shut down the year-old parliament and ruled the Ottoman Empire in the last quarter of that century: his primary motivation was to fill up his personal treasury by selling privileges to European companies. In the same decades, the United States was going through its Gilded Age characterized by ostentatious displays of wealth by its robber barons, while Junkers under the leadership of Bismarck managed to grab much (if not most) of the wealth created by the newly-born German industries. That period did not end well: 1915 was one of the major human costs peoples of Anatolia had to endure, while the Ottoman Empire was swiftly dissolving during the First World War. The United States went into a great economic depression in 1929 triggering totalitarianism in Europe. In return, German totalitarianism cost no less than 70 million people’s lives during the Second World War. In short, if the late nineteenth century is the right period to learn more about today’s authoritarianism, the lesson is that petty strongmen pave the way for totalitarianism. This is because resources facilitating authoritarian parasitism are not sustainable. Putin prospered politically thanks to the hike of oil prices. Erdogan benefitted from the outsourcing of ecologically harmful industries out of Europe and the devastation of Iraq due to the civil war in the wake of the U.S. invasion. Trump abuses the U.S. dollar’s and the military’s credibility to stay on course. These leaders will soon need other resources to stay in power. However, they will not be able to find creative solutions other than one or another form of violence and it is exactly this lack of cunning that makes them dangerous. And institutions will not work when they are supposed to. This is one of the most important lessons we learned from the Turkish case: the judiciary gave a free pass to Erdogan’s corrupt business deals. University administrations and even critical-sounding scholars facilitated the purge of Academics for Peace. Institutions supposedly responsible for the regulation of the banking system such as the Banking Regulation and Supervision Agency are debilitated. The Turkish Supreme Court allowed Erdogan to issue government decrees violating the Constitution during the two-year state of emergency between 2016 and 2018. Last but not the least, the Turkish Supreme Electoral Council counted invalidated votes as eligible for the referendum in 2017 that gave monarchical powers to Erdogan. To expect democratic institutions to stop the strongmen was a pipe dream in Turkey. They failed to fulfill their function and collapsed under the duress, exactly when they were needed the most. Their erosion began with the appointment of people without any ethical values and with the lowest self-esteem to key positions. Thus, authoritarian parasitism is not just a temporary phase in world politics, but a major threat to the democratic achievements of humanity. The people of Turkey have seen this clearly for the last three decades: Erdogan’s parasitic style of politics has corrupted any relevant institution and political movement in one way or another. The parasite now owns the host in Turkey and the infection is contagious. If it is not stopped now, authoritarian parasitism is likely to evolve into the twenty-first century’s totalitarianism in coming decades, which will surely be much more devastating than its twentieth century cousin. Utku Balaban is an Associate Professor of Sociology, a former faculty member of Ankara University, and a research fellow of EUME and Humboldt University’s re:work in Berlin, Germany. In his work, Balaban focuses on how industrial globalization frames local political movements such as Islamism. He was dismissed from his position at Ankara University with a statutory decree in February 2017, because he undersigned a declaration as known as “the Peace Petition” to protest the violence against Kurdish citizens by government forces in Turkey. What's so 'Jewish' about The New School?